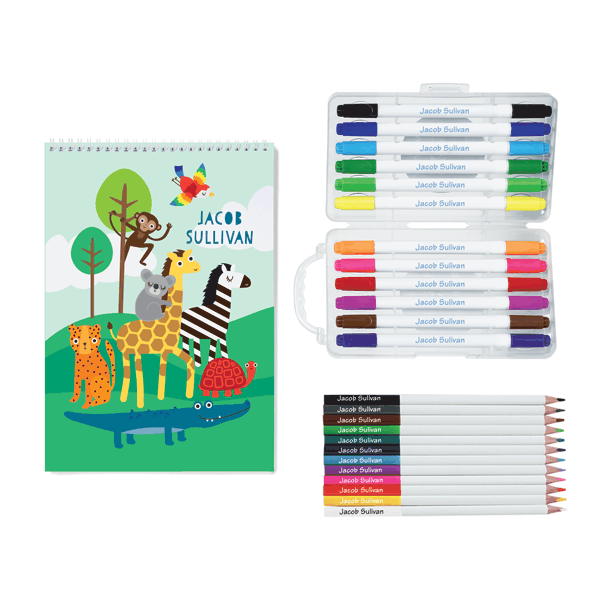 This Budding Artist Kit is the perfect way for kids to fine tune their creativity skills! Kids will love drawing and coloring using their personalized sketchbook, markers and pencils. This kit is perfect for holidays, travelling or at home. Each page is personalized with your child's name and includes a space for a date so that you can document your child's artistic progress. Our fun designs can provide inspiration to little artists and the A4 size is great for using in the car or when out and about. With your child's name printed on each page, our sketchbooks are perfect for children to share their creations with parents and grandparents.